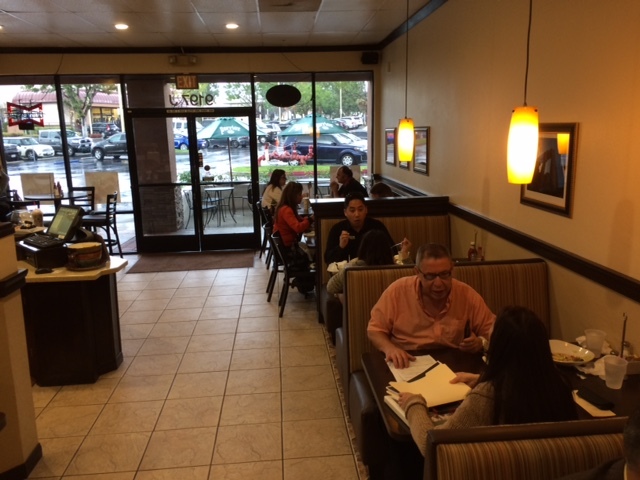 The former Theo’s Cafe in the Montclair East center east of Montclair Plaza was, if memory serves, a Greek-owned coffee shop in fairly traditional mold but with a few specialties. 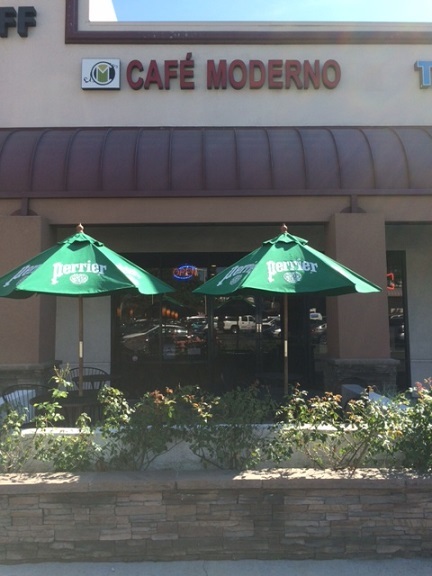 It closed after a long run in 2014 and was overhauled to become Cafe Moderno. A friend and I met there for lunch. The menu has wraps, salads, sandwiches and entrees, plus beer and espresso. You order at the counter. Our food arrived within minutes. 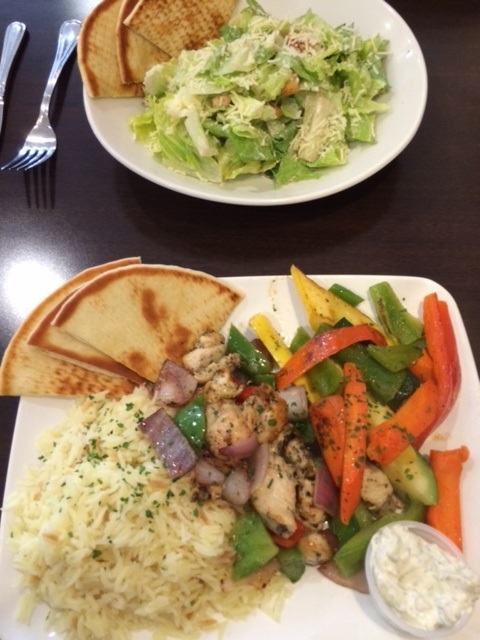 I got chicken souvlaki ($10), skewered cuts of seasoned chicken with bell peppers and onions. This came with two sides; I chose rice pilaf and grilled vegetables. The result was tasty and filling, not to mention relatively healthy. My friend got a Caesar salad ($5), which he liked as is; you can add items like chicken or salmon for another $3 to $4. Me too. In fact, two days later I was back for lunch. (I needed a photo of the exterior because on my first visit it was pouring rain. 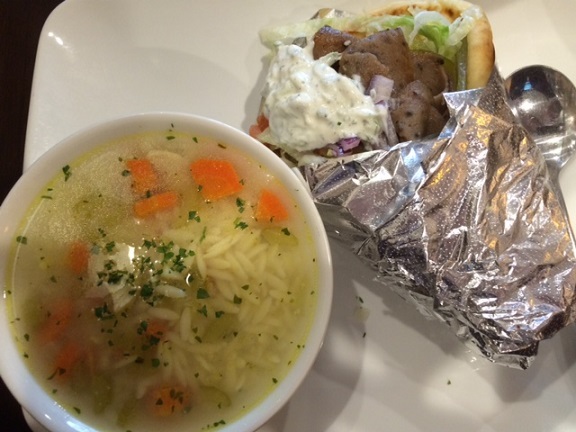 And since I was going to be there anyway…) I got the gyro wrap ($6.65) with chicken orzo soup ($2). As a gyro fan, I liked this version; the tzatziki sauce was especially minty. The restaurant was nearly full this time. There aren’t enough Greek restaurants in the area. It’s good to have one — and freeway-close, too. This entry was posted in Restaurants: Montclair and tagged Greek, Montclair, restaurants by David Allen. Bookmark the permalink. This is a favorite place. We missed Theo’s and were happy that Moderno kept a version of the famous Theo’s Salad. We usually get take out, but agree that the interior is pleasant and clean. The food is quite good and well prepared. There’s a nice variety for my vegetarian friend and lots of choices for me. Convenient lunch place. Good to hear from someone who knew Theo’s better than I did. Thank you for pointing out the Theo’s Salad on the menu.